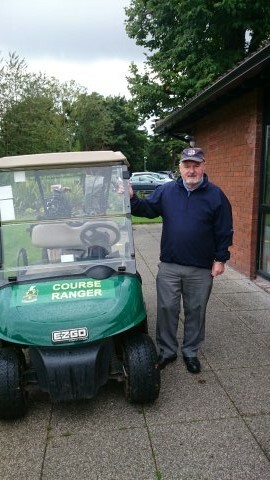 President’s Prize (Des Donnelly) Prize at Woodbrook GC on Friday May 20th. Tee times 12.20pm – 2.00pm. Contact Tony Kenny on 087 2623700 to get on time sheet. Captain’s Prize (Alan O’Connor Jnr.) at Newlands GC. This outing is scheduled for August 13th. Further details will be posted soon. 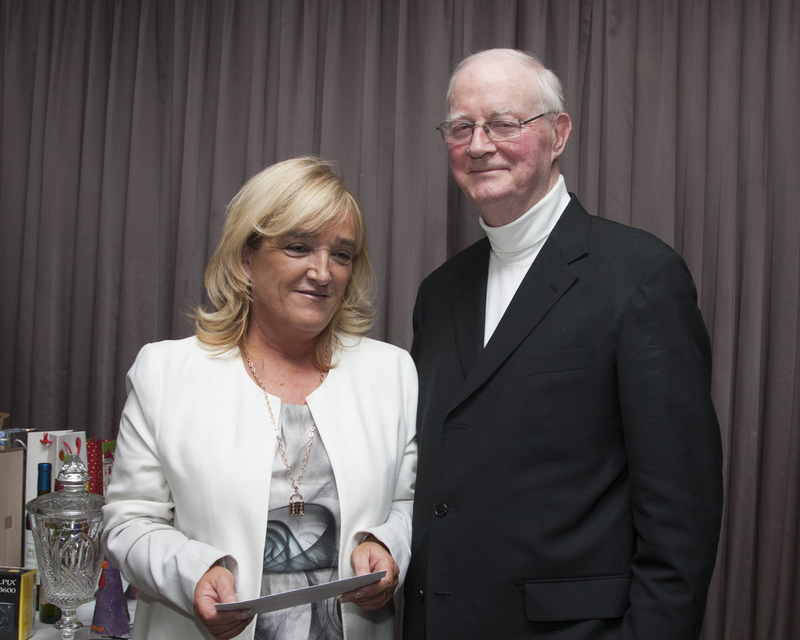 Pat McGrath Memorial Trophy and Christmas Outing at Foxrock Golf Club – details soon. 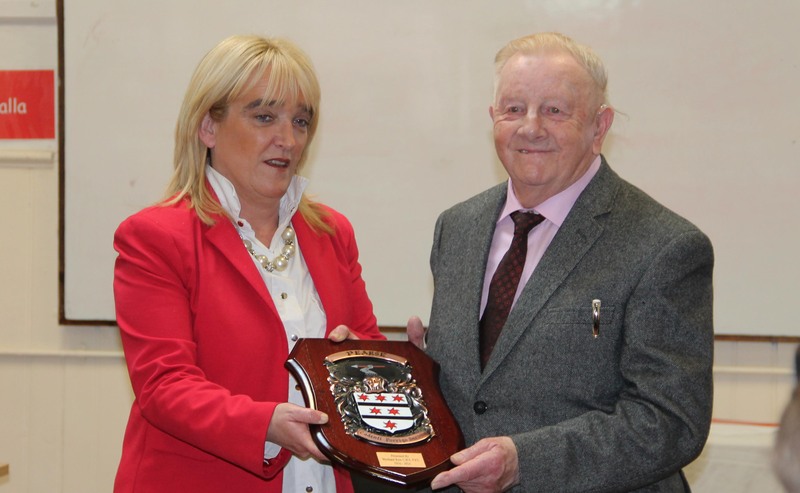 Last year’s President, John Cullen, presented a specially prepared Pearse family Coat of Arms on behalf of the PPU to the school at a ceremony in the school on Monday March 14th. 2016. 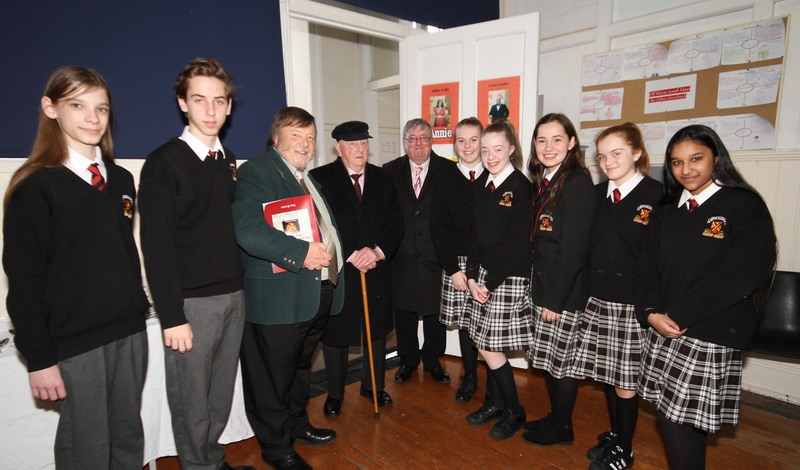 This was the first of a number of planned events to honour the memories of our famous past pupils, Patrick and Willie Pearse who, of course, were leading figures in the Easter Rising in 1916. Many other past pupils also participated and they will all be remembered and honoured suitably within the next few weeks. 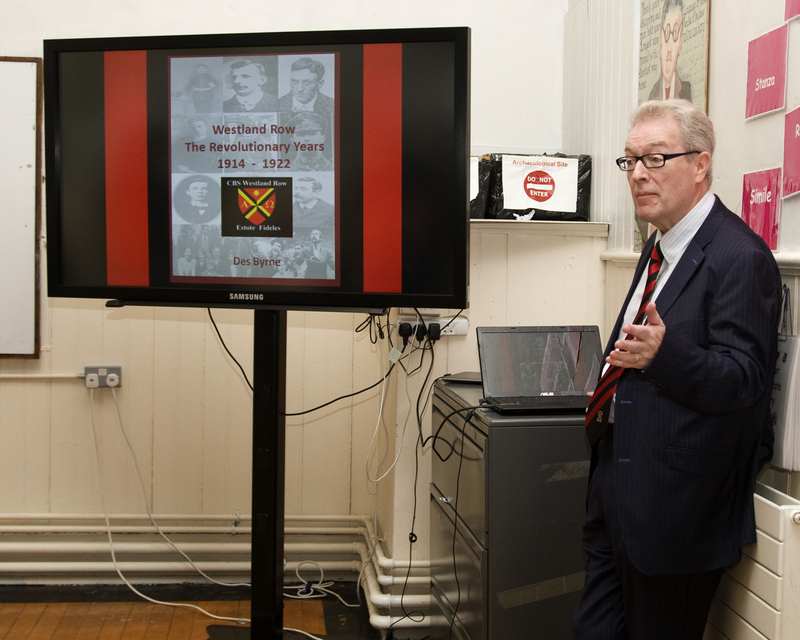 The presentation on March 14th was attended by 87 year old Noel Scarlette, grandson of the half brother of Patrick and Willie as well as Noel’s two sons and daughter in law. 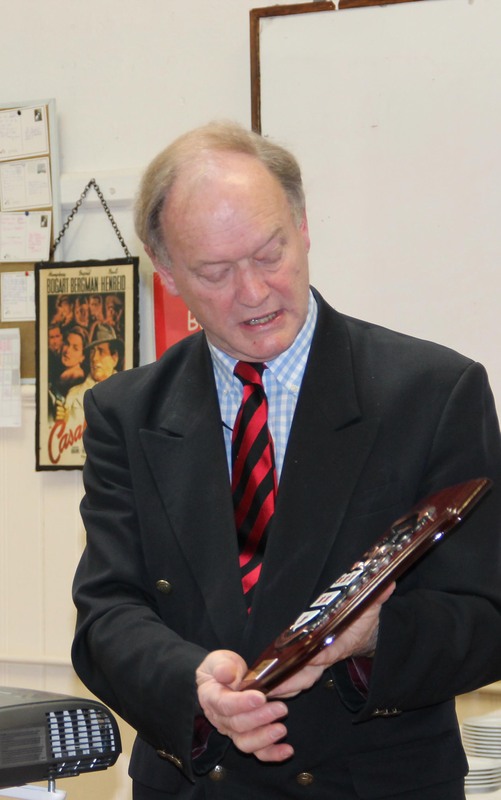 School Vice Principal Eddie Kelly gave a very interesting talk on the Pearse brothers. Below are some photographs from the event. 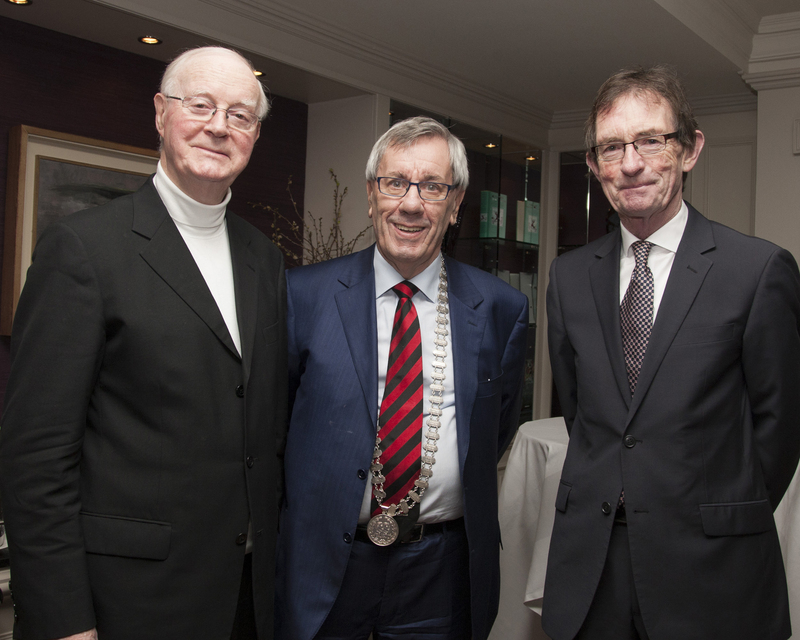 Brian Duncan (Class of 64) was presented with the President’s Chain of Office by outgoing President, John Cullen, at the PPU AGM on April 6th 2016. 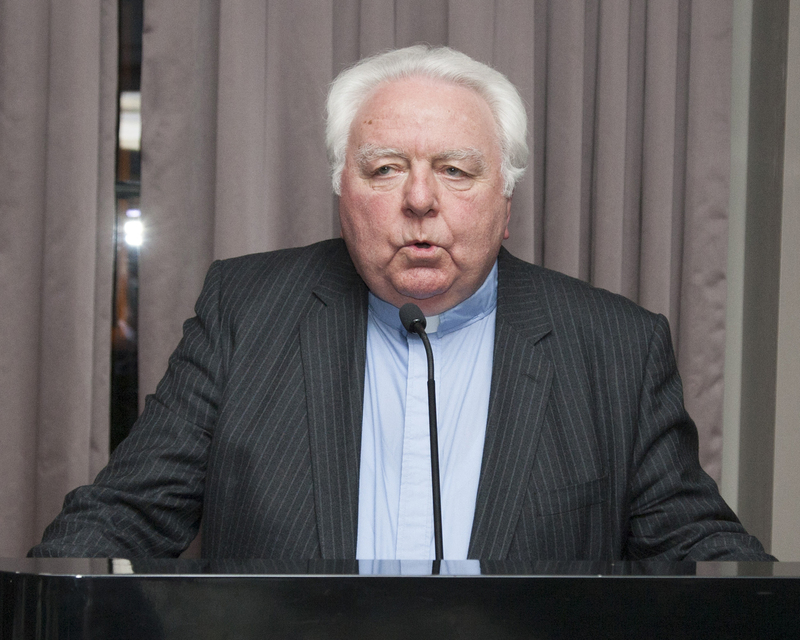 Brian was Row Man of the Year in 1992. He graduated as an Actuary and has enjoyed an illustrious career in business with Irish Life Assurance, VHI and Mercers. 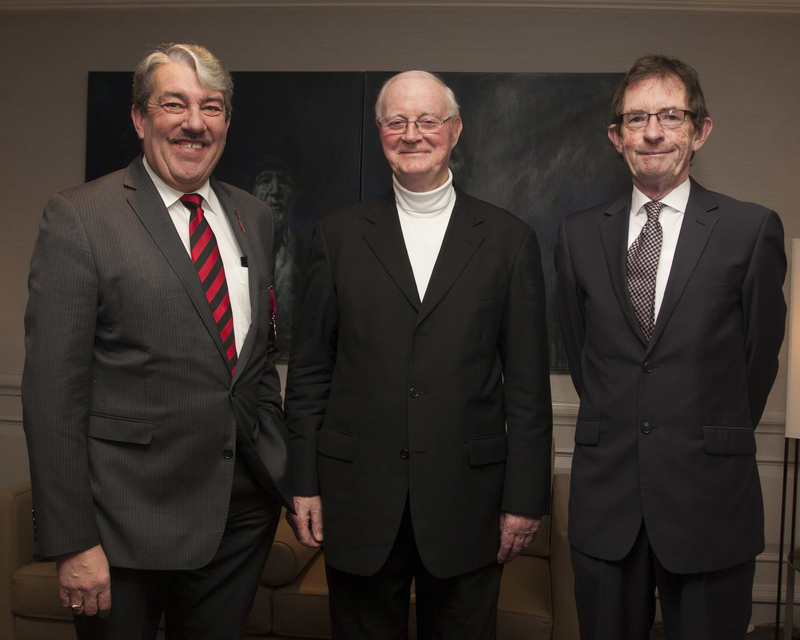 He is currently Chair of Irish Pensions Trust. 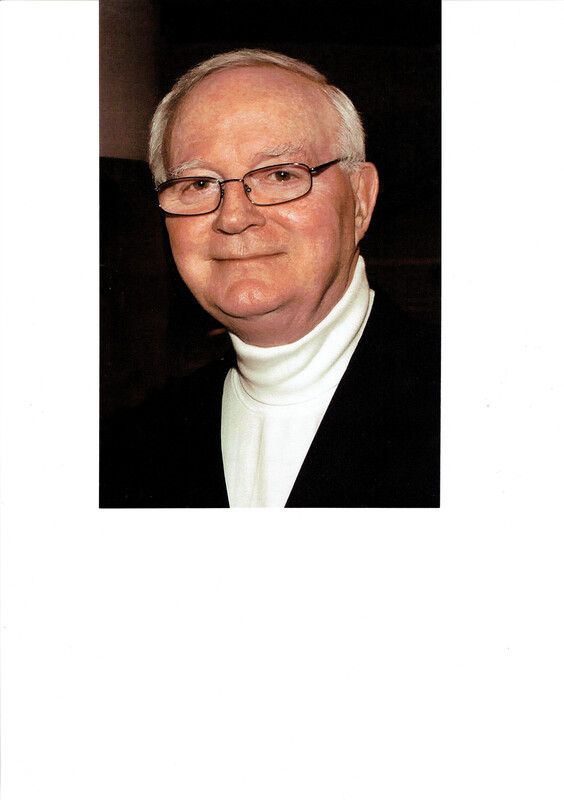 He also served as Chair of the school’s management Board. 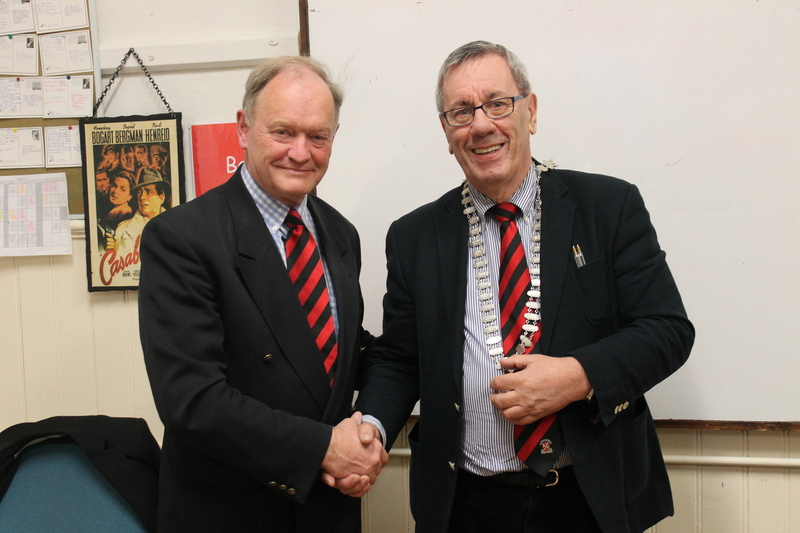 The President, John Cullen, reported on another busy year of PPU activities at the Annual General Meeting held in the school on Wednesday, April 6th 2016. 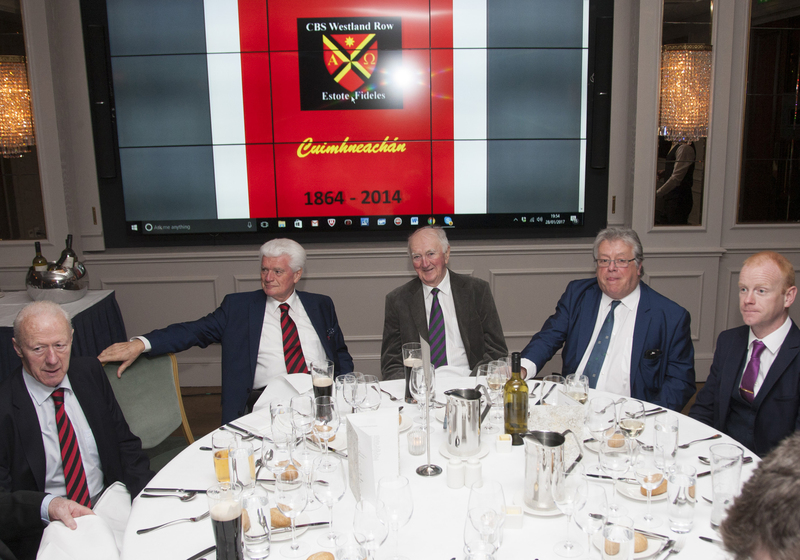 The full committee met 10 times during the year and completed a number of big projects to celebrate the 150th Anniversary and prepare for the 100th anniversary of the 1916 Rising in which many past pupils of the school played prominent parts. The following is a brief report on the projects completed and currently in hand. 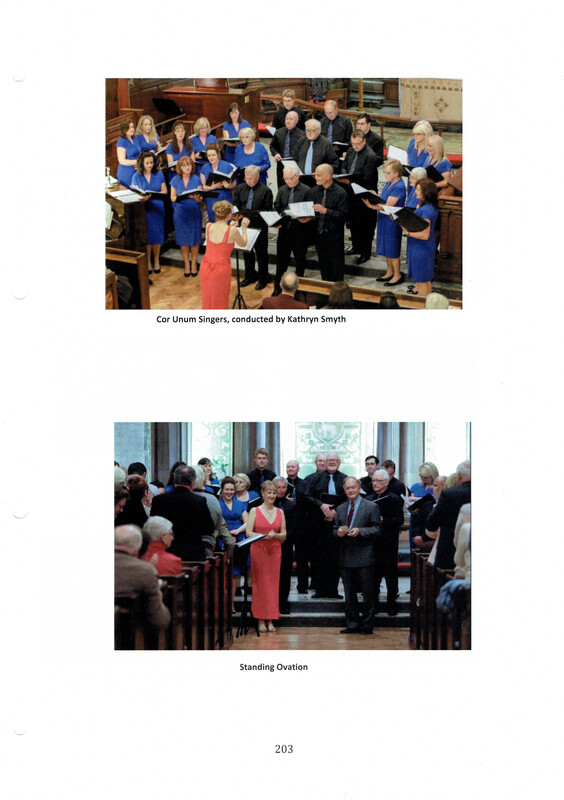 Our 150th Anniversary Concert “Maytime Melodies”, was held in St. Anne’s Church, Dawson Street , Saturday May16t 2015 and was an outstanding success. Huge thanks are due to Des Byrne and Behaviour and Attitudes for organisation and sponsorship. 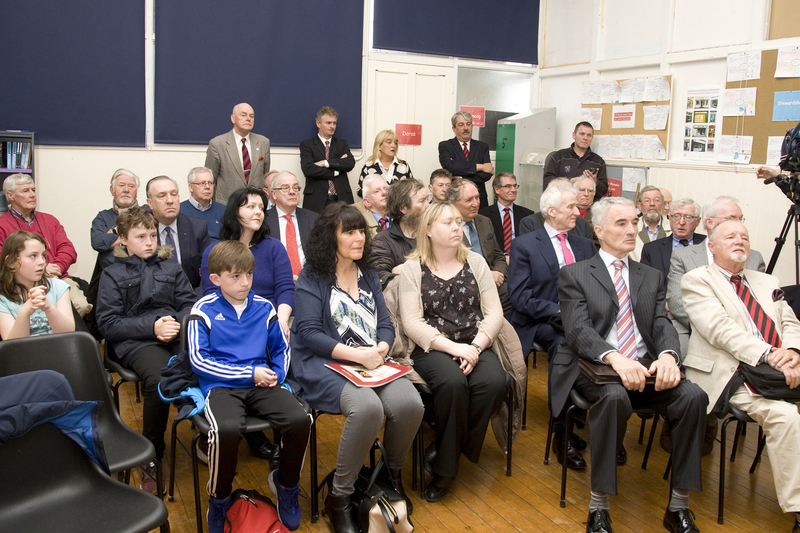 There was a very good attendance and, as a result, the PPU was able to present a cheque for €4,000 to the school to help to update the computer room. 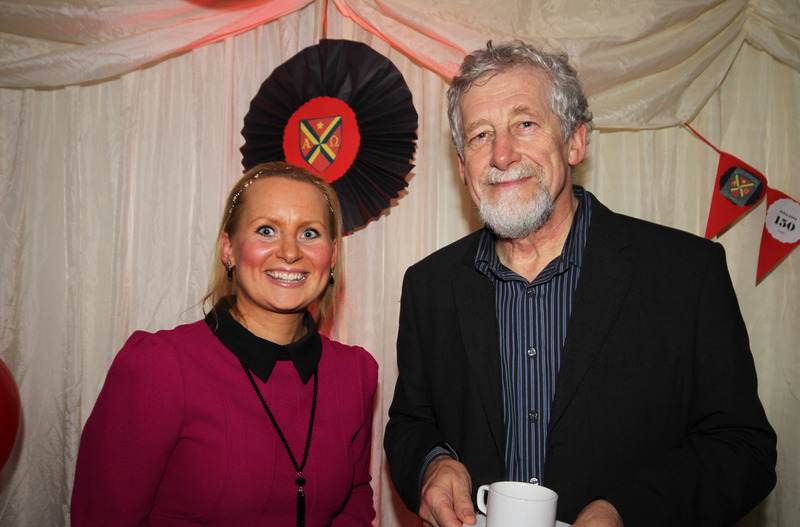 The school principal, Kate Byrne, hosted an Open Night in the school on Thursday November 26th. This was well attended and most enjoyable. 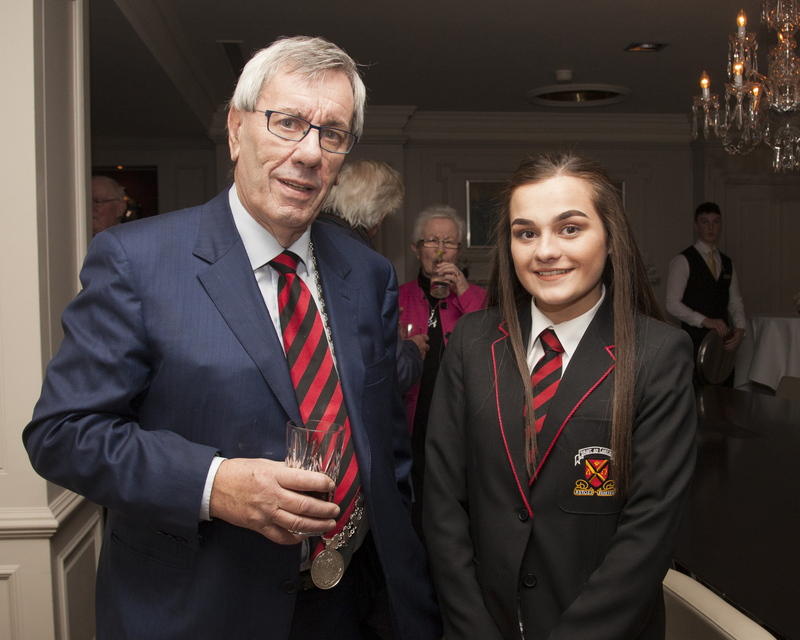 Great praise and thanks are due to the staff and pupils who worked very hard to make this an enjoyable occasion. The big project to digitise, and make searchable on line, the roll books dating back to 1864 was completed during the year. At present, the records are searchable using Microsoft Access Professional but this will soon be converted to the Microsoft Access version available on most laptops. Having completed the 150th. 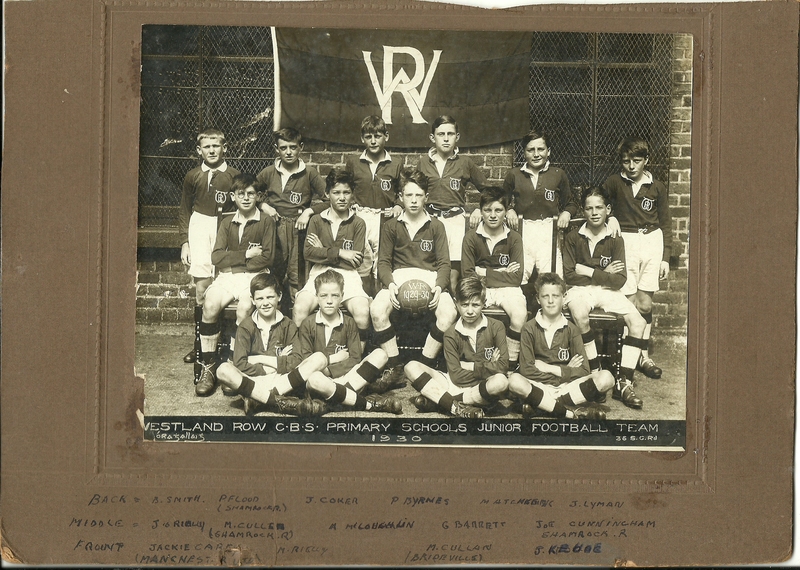 Anniversary celebrations, the PPU set out to capture these and the history of the school in a suitable publication. We originally thought that this would be in digital form but, having secured generous sponsorship from the Christian Brothers and Dublin City Council the committee decided to produce it in book form. The Revolutionary Years section was also produced in a separate book with the Dublin City Council logo. 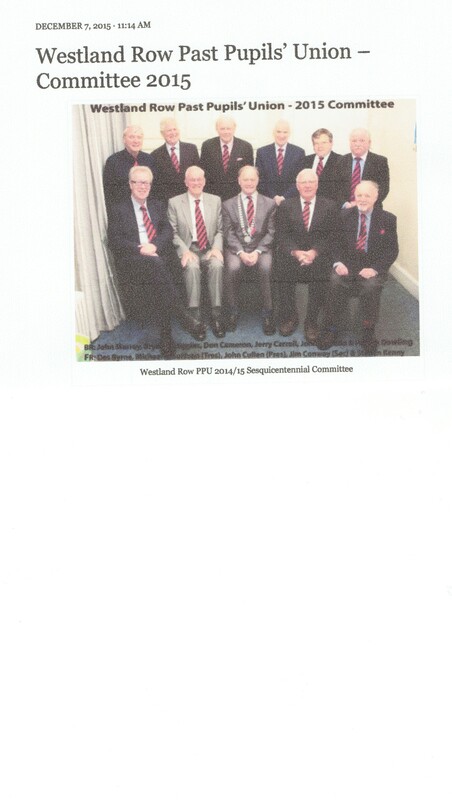 A small committee consisting of President, John Cullen, Des Byrne and Jim Conway worked on this and set a deadline so that the finished book would be printed in time for launch at the annual dinner on January 30th 2016. The committee received invaluable help with layout and compilation from Des Byrne’s former secretary, Mary Gilleran and a final draft was presented to printers, Typecraft Ltd. (Bill and John Doran’s old company) in mid December in time for our deadline. 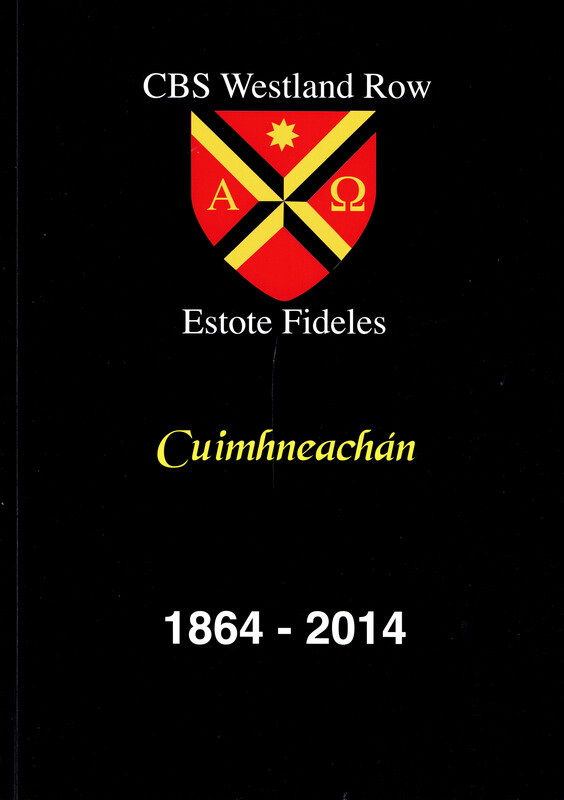 The book, named Cuimhneachan 1864 – 2014 was launched to wide acclaim at the dinner. 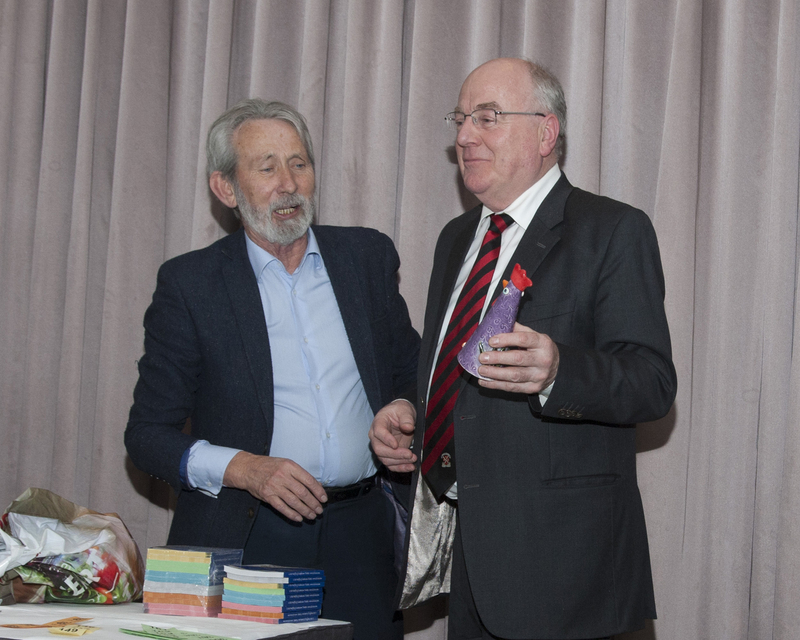 At the launch, the President said that special thanks were due to Des Byrne who authored many sections of the book including The Revolutionary Years, Local History etc.. Jim Conway authored some of the Sport and Row Persons sections and Br. Paul Hendrick helped with the school history. 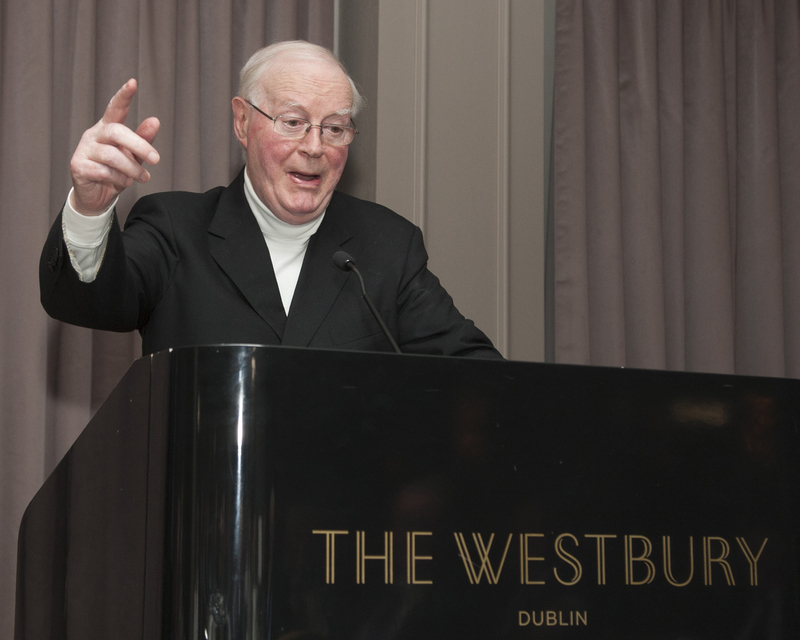 John Cullen wrote much of the Sport History was well as doing a great job of editing and pulling everything together. The book has met with wide acclaim and is still very much in demand. Some copies are still available from Jim Conway (087 2557298). Perhaps the nicest compliment received was from Shay McConnon who said that if he was on “Desert Island Discs” it would be his “one book of choice”. 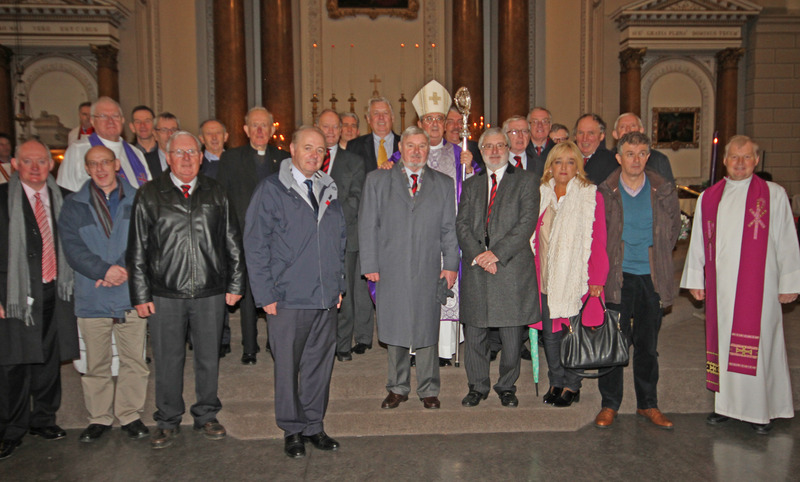 The annual Mass for deceased past pupils was held at St. Andrew’s on Sunday November 29th and was celebrated by Archbishop Dr. Diarmuid Martin and a number of past pupil priests including Fr. 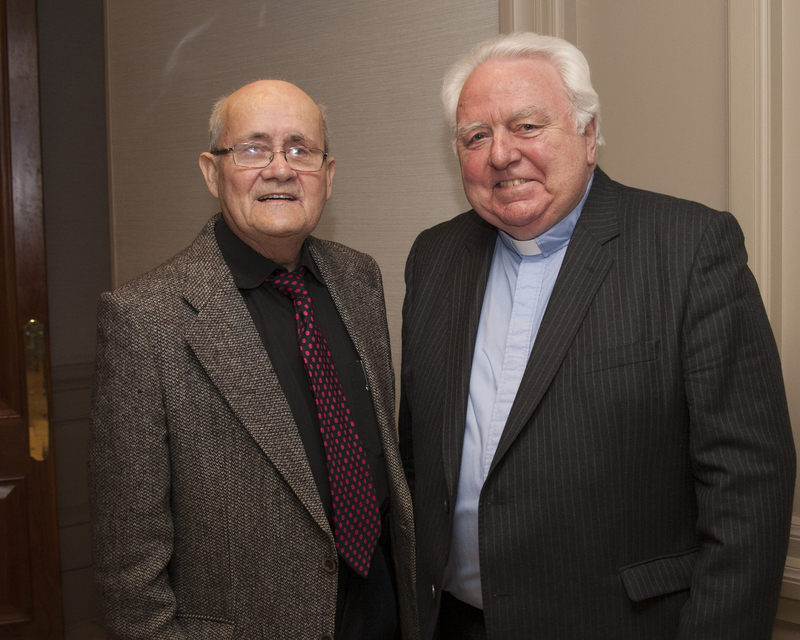 Eugene McCarthy, Monsignor Dan O’Connor and Canon Patsy Fagan. 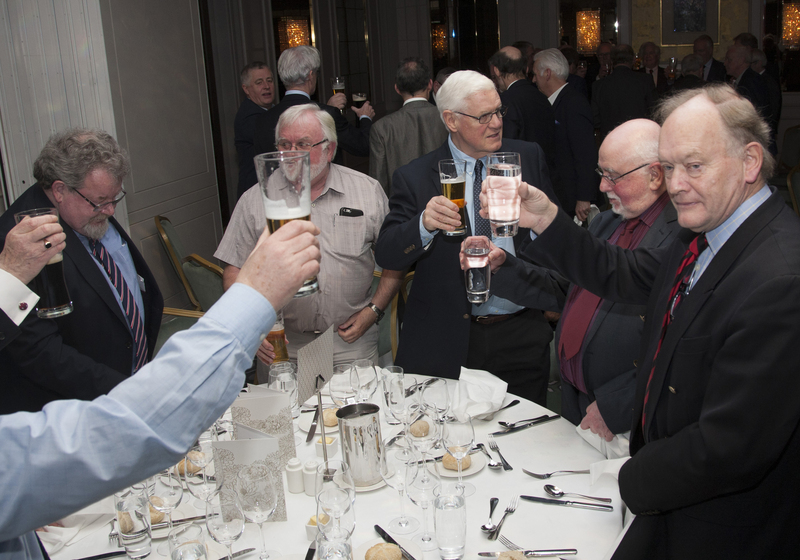 A number of past pupils attended and the lunch afterwards in the Alexander Hotel. 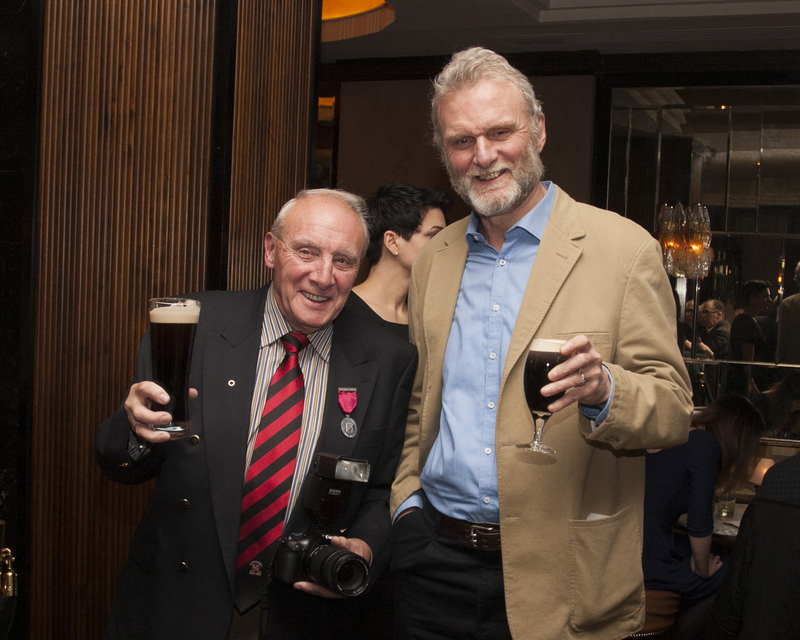 Brian Whelan, of Bermingham Cameras fame, was elected Row Person of the Year 2016. Brian’s biography was published in a previous Blog. 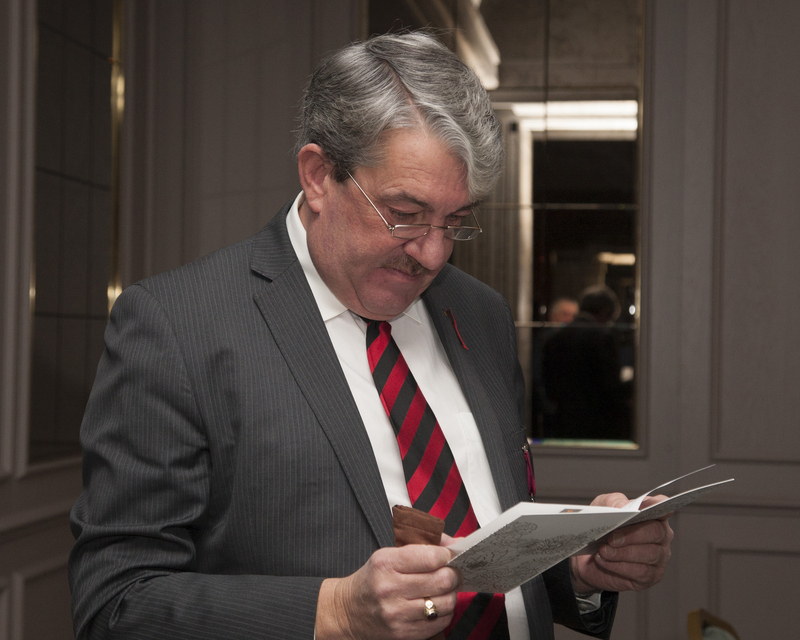 Brian has made a great contribution to the committee since coming on board. 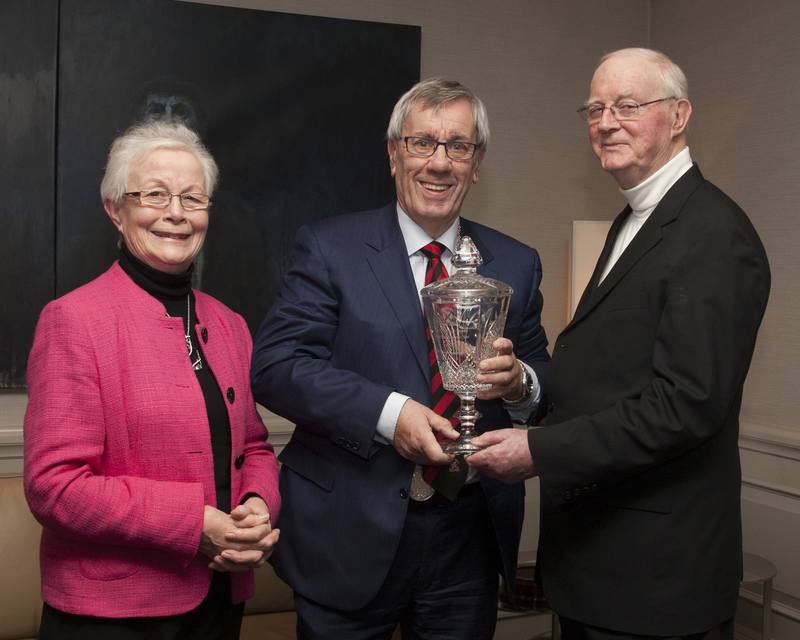 Happily, Brian recovered from illness in time to attend the dinner and entertain all present with a most impressive speech on receiving the P V Doyle Memorial Trophy. 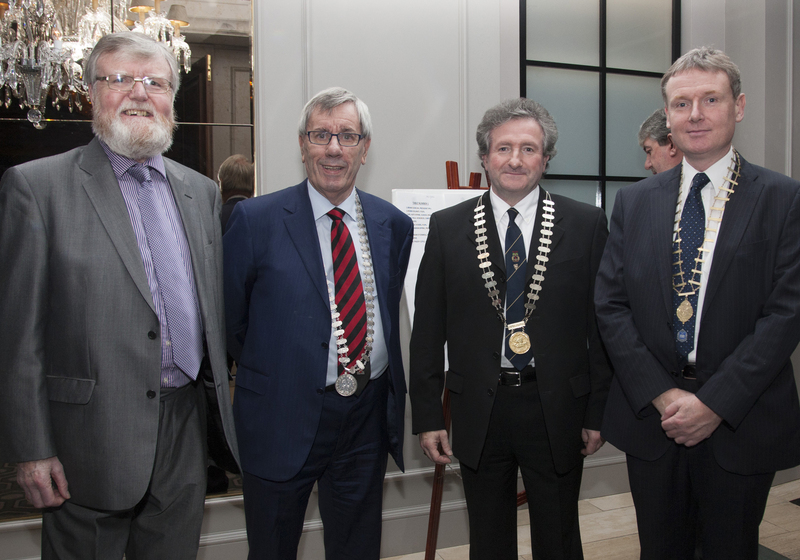 The Annual Dinner was held in the Westbury Hotel on Saturday January 30th. 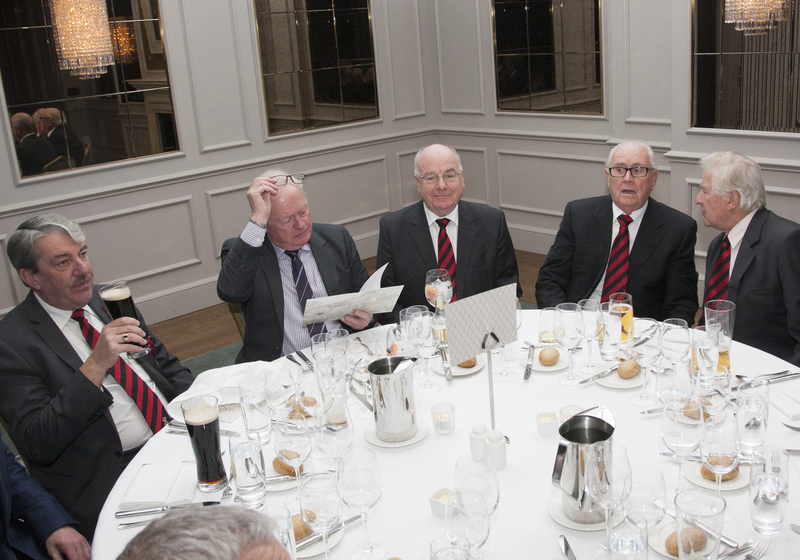 The dinner was well attended and very enjoyable. 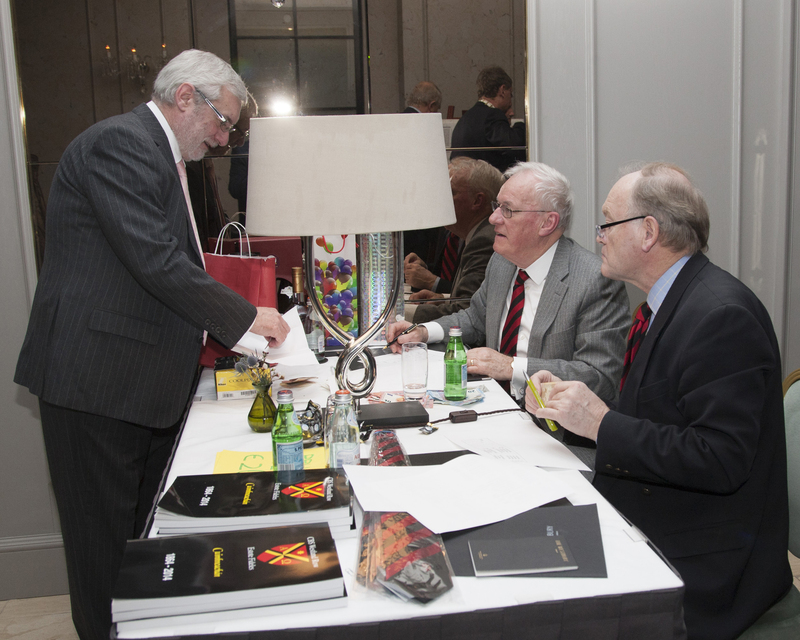 The President, John Cullen, launched our 150th Anniversary Publication Cuimhneachan 1864 – 2014 and many copies were sold on the night. 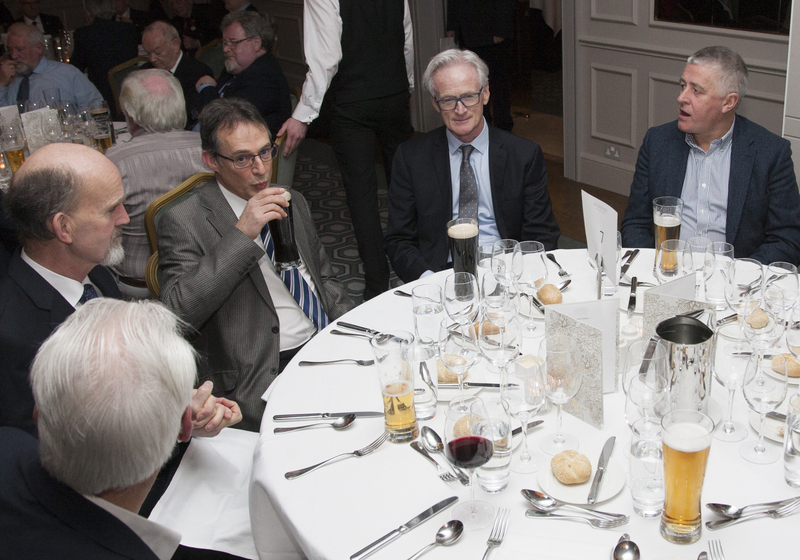 Having completed a very busy period as outlined above, the committee has since been involved in a number of projects to commemorate the 1916 Rising. These are very important in view of the huge involvement of past pupils in the Rising and, of course, Patrick and Willie Pearse. 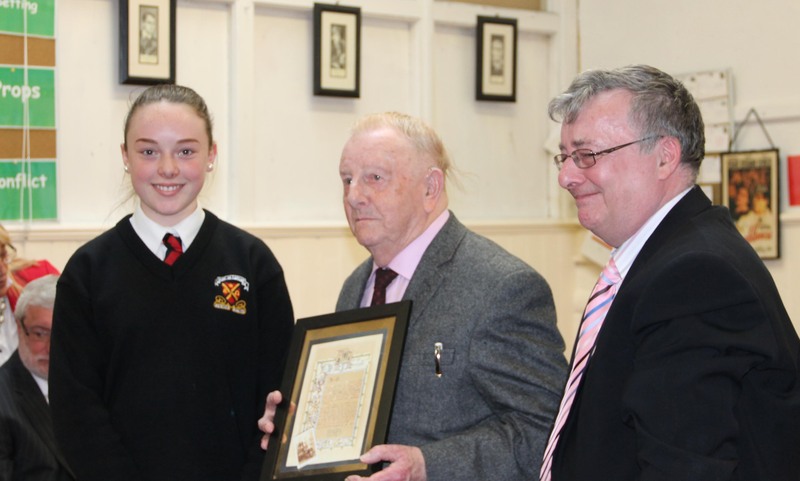 The PPU presented a special Pearse family Coat of Arms to the school at a ceremony on Monday March 14th. 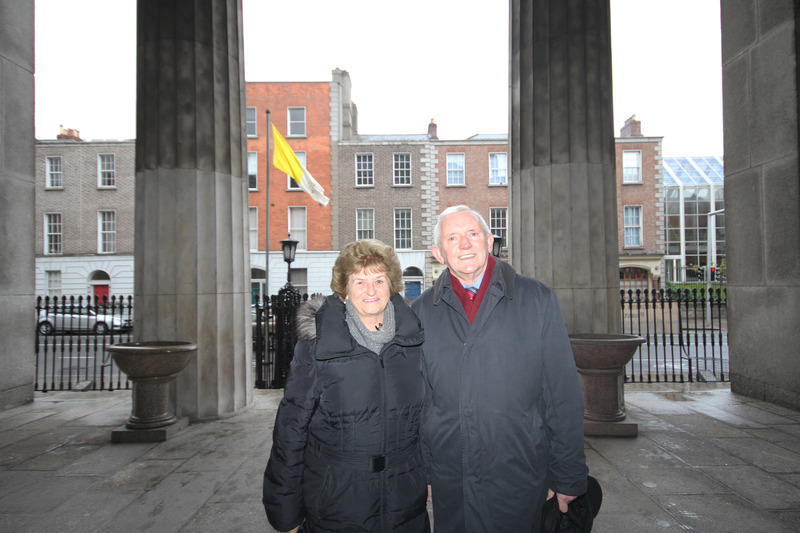 This was attended by 87 year old, Noel Scarlette, grandson of the half-brother of Patrick and Willie as well as Noel’s two sons and his daughter-in-law. 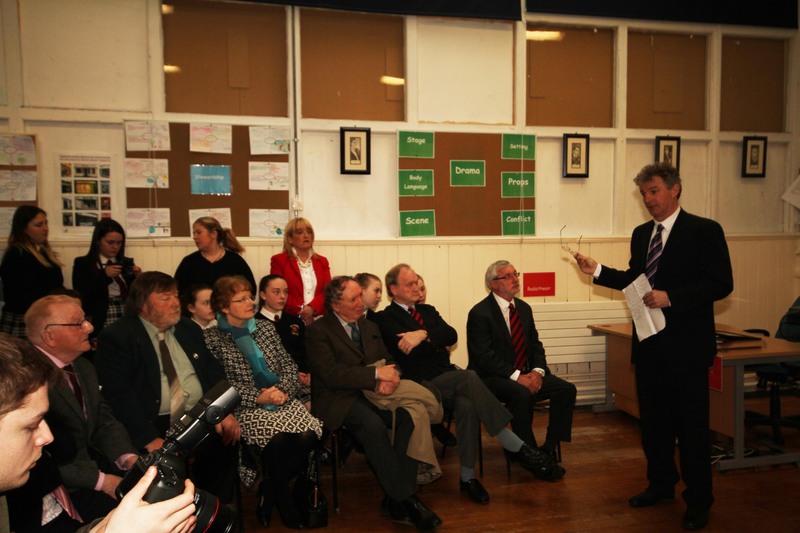 Vice Principal Eddie Kelly, gave an excellent talk on the Pearse brother as part of the ceremony. 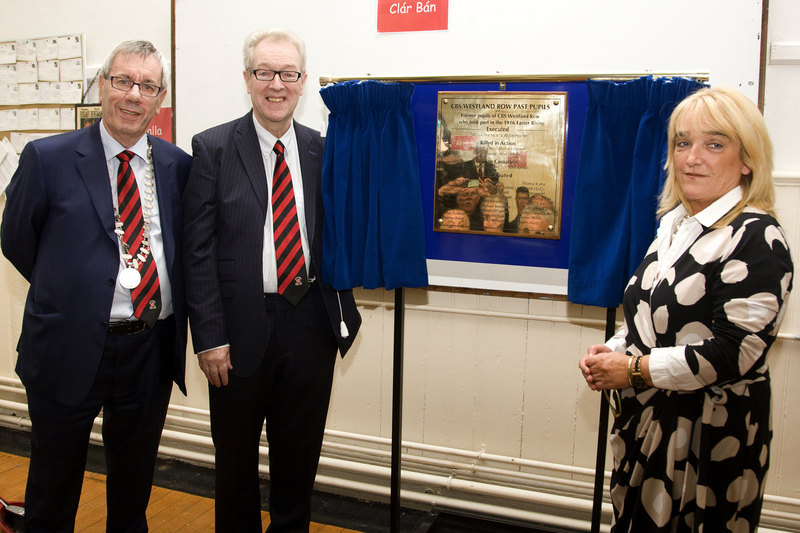 The PPU has commissioned two plaques to honour and commemorate all the past pupils who participated in the rising. A bronze plaque will be erected outside the school to honour those who died and a brass plaque will be erected inside to honour all those who died and participated. 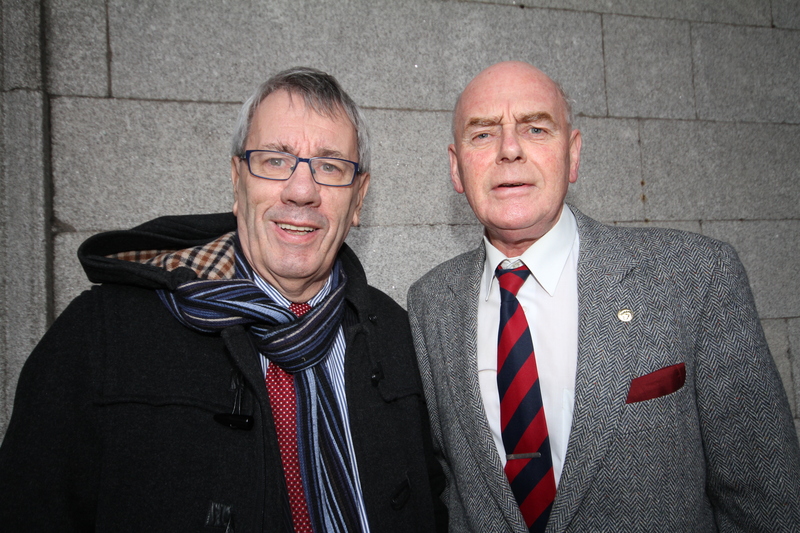 We are aiming to have the unveiling ceremony on either May 3rd or 4th which are the dates of the execution of Patrick and Willie Pearse respectively, but this has yet to be confirmed. We are hoping to arrange an anniversary Mass in St. Andrew’s as soon as we have a firm date for the unveiling. Details will appear shortly on the website. 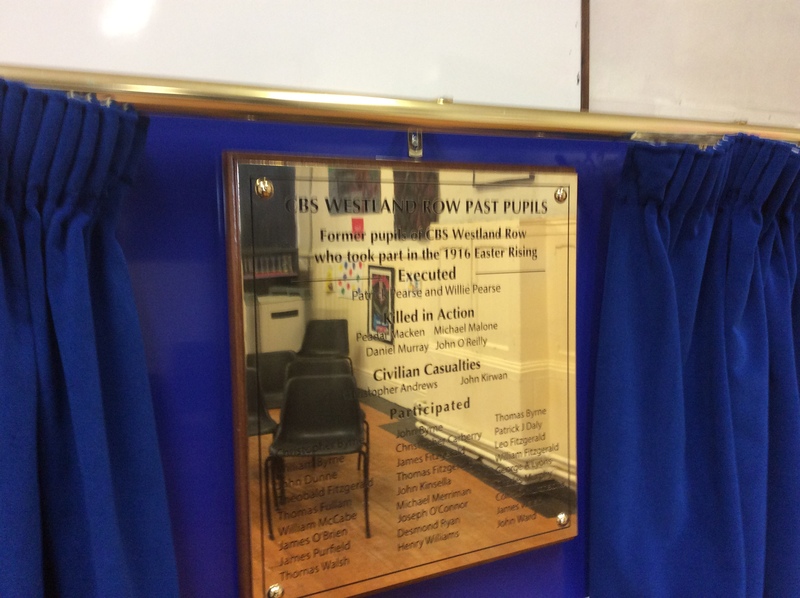 We would be delighted to welcome past pupils in general to this unveiling, but in particular relatives of those whose names will appear on the plaques. 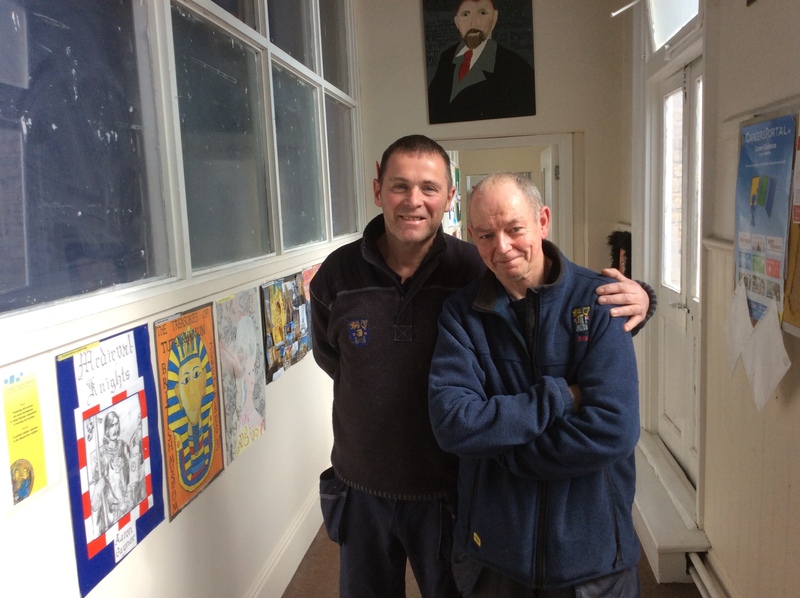 Brian Duncan and Gerry Cassidy. Gerry travelled from Connemara for the Mass and lunch.